Swamp Rabbit and I had just watched a PBS show about “nightmare bacteria” — insidious, human-killing organisms resistant to all antibiotics. Pretty scary. 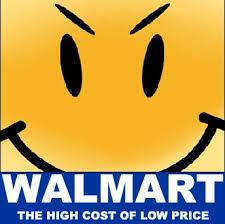 Then we saw a news item about Barack Obama appearing at a Walmart to praise the company for using green energy. Really scary. It occurred to me that Obama is the nightmare Democrat, an insidious organism resistant to all strategies and tactics for progressive change. During his time in office he has methodically hacked away, along with most Democratic legislators, at what remains of the Democratic Party’s credibility. There is no campaign promise he hasn’t broken, no Republican legislator he hasn’t caved in to, almost no Democratic constituency he hasn’t betrayed. He has disappointed on climate change, jobs creation, income inequality, regulation of big banks. He has eagerly pursued the so-called Grand Bargain, devised by right-wingers to shred the social safety net and put the final nail in the coffin of FDR’s New Deal. He is the anti-FDR. The rabbit started chuckling when I said “not fair.” When he came up for air, he offered me a hit of Wild Turkey and invited me to take a swim in the swamp with him. I told him no thanks, I didn’t want to get infected by nightmare bacteria. This entry was posted in climate change, economic collapse, globalization, humor, liar, mainstream media, Obama and tagged Barack Obama, FDR, green energy, neoliberal, New Deal, nightmare bacteria, Robert Reich, swamp rabbit, Walmart. Bookmark the permalink.